I candidly remarked about how we can have lunch at Changi Airport for a change, when my male colleague (our designated lunch 'chauffeur') send our bosses off for their holiday to Korea. Little did I know, he actually brought it up to our bosses and off we go for a lunch there, that Friday. Everyone was in a jovial mood that time. It's a Friday and our bosses were going off for a week-long holiday, what do you expect...? Hee. We ladies were made to choose the restaurant to dine at. Scanned through all the dining establishments at all 3 terminals and settled for Earle Swensens at Terminal 3. We were first drawn to the term 'Salad Bar'. Secondly, our bosses will be departing from that terminal anyway, so it'll be convenient for them. As soon as we saw the Lunch set menu, all of us unanimously agreed to take it. The set include the salad bar, a main course, coffee/tea and a scoop of ice-cream. All sets cost under $20. Not bad. I go crazy at salad bars. Cos' I'm crazy about salads. Uhmm, something like that. 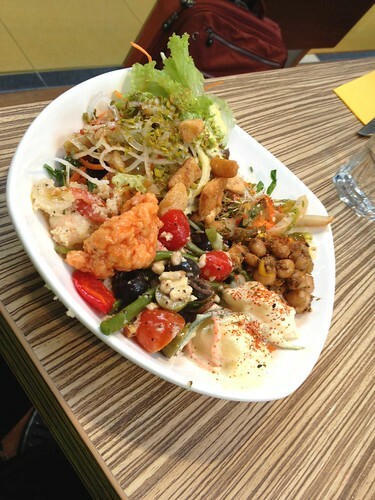 I was exhilarated to see many varieties of speciality salads and piled on EVERY single type into my bowl. Stuff like Seafood couscous, Greek salads with feta cheese, Thai salad, Mediterranean chickpea salad and some others. Not. Enough! Despite all the choices, however, I still prefer the varieties available at the salad bar in F.I.S.H. One of my colleague's choice. This is one one the various mains offered in their lunch set. Another main item for the lunch set. I can't recall what this actually was but I remember it's grilled cod fillet with some spicy seasoning. Maybe it's paprika instead of cajun. Something like that. 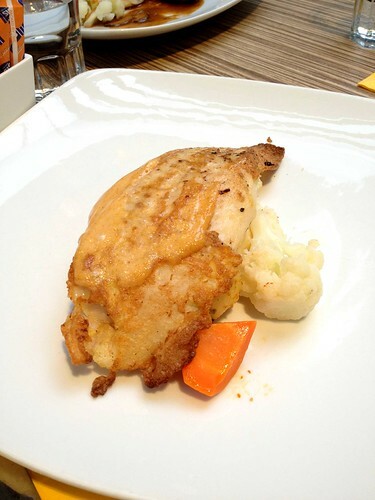 Served on a bed of veggies and mashed potato. Another female colleague's order. She was looking for something 'spicy' so I guess this might suffice. Also a main offered as part of the lunch set. 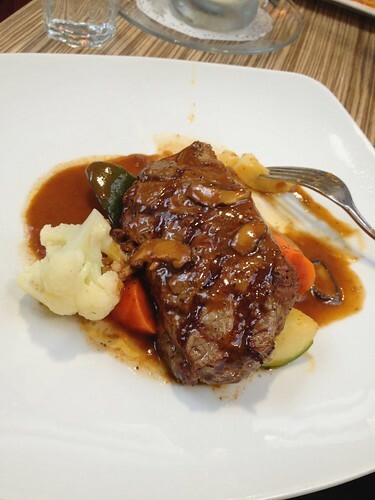 Served with seasonal vegetables and mushroom sauce. Ordered by my 'picky' male colleague, my female boss and myself. I was really hoping that the steak fared well in his books or we'll hear no end from him about how sucky Swensen's really is (he kinda' bear a grudge against them??). The first plate arrived and we asked about the doneness of the steak. That question kinda' got the young server taken aback and he hurriedly mumbled, "Medium. Medium.. erm.. rare." So that plate went to my male colleague (even though I ordered first and he was the last to place the order for the steak… Hmm…). Both my boss and I requested for medium. Meanwhile, we were all looking at my colleague as he cut into his meat and had a bite. He gave a positive nod. ...Phew! It was almost time for my boss's flight and she called out urgently for her food to be brought out, as she had a flight to catch. Our steaks soon arrived. Hers was indeed of medium doneness but mine was a lil' bloody. Even my colleague sitting beside me noticed it and she shuddered. Another thing I noticed was that the 1st plate of steak was served with mashed potato while the other 2 plates were served with homemade, baked potato wedges. I prefer the wedges, thankyouverymuch. Oh, the other mains offered for the lunch set was the Pan-fried Veal, which I was most curious about but too bad the steak was calling out to me. A tad disappointed that no one at my table ordered it though, cos' I really wanna see how it look like. My boss felt like having some pasta and he was grumbling about how their pasta came in sharing portions. So his wife offered to share this pasta with him. And she cancelled her lunch set (which comes with the salad bar option). When she recce the salad bar later on, she decide that she want to have some too and asked how much it will cost her to opt for the ala-carte option. She balked at the $12.90 price tag and realised that it's much cheaper to get the lunch set. So she reinstated her lunch set order and remarked that my male colleague "can help her finish the food." 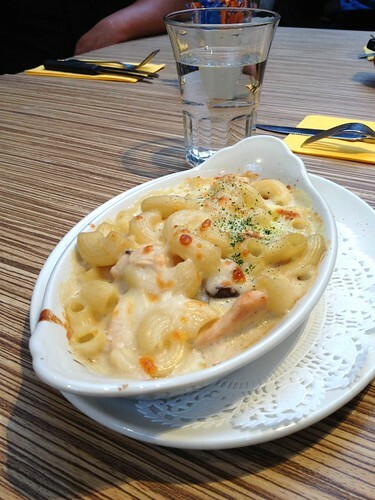 When this was served, we were like, "Whoa!" My boss remarked about them using an 'actual' lobster for that price, which was deemed cheap. ALL of us end up sharing the pasta (yes, that much). We were disappointed with the chilli sauce which is the sauce generally used for Chilli Crab, save that this one here was a tad too sweet and greasy/oily. The spaghetti was nicely 'al-dente', though. 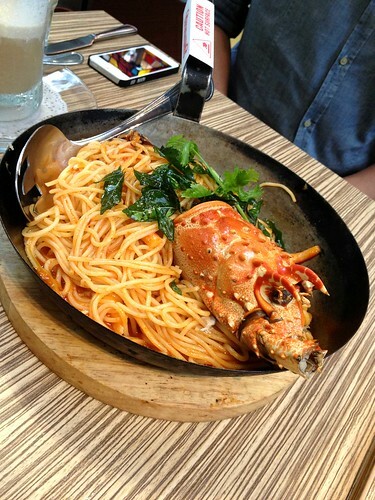 And yeap, a whole lobster was used. Something bitter to wash things down. 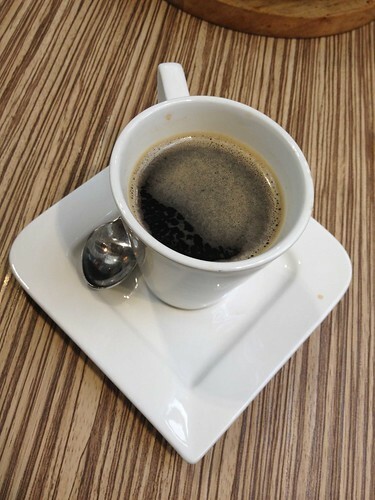 Ok, ok lah, this coffee. Maybe I'm just spoilt rotten by those specialised coffee introduced to me by my colleague. Ok, so we end the meal on a bitter-sweet note, actually. The set meal comes with a scoop of ice-cream for desserts. 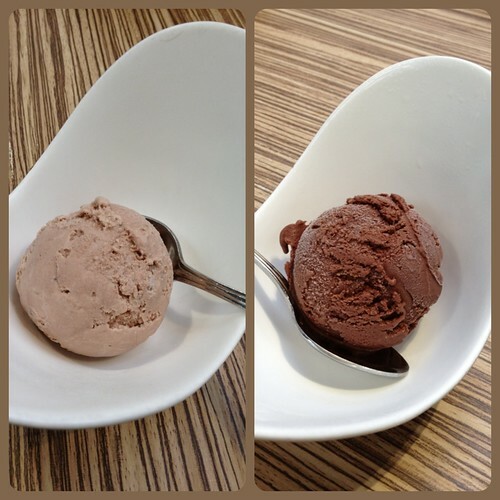 I chose the Frosted Chocolate Malt (left) and my colleague Roza had the famous Sticky Chewy Chocolate (right). We were curious about those icy particles in our ice-cream. Even my boss noticed it in the half-melted vanilla ice-cream in his root-beer float. Obviously caused by re-freezing after a some melting, no? You people gotta check your ice-cream fountain, seriously. All in all, I conclude that Earle Swensens is supposedly the more 'atas' (classy) version of the regular Swensens? Food's definitely better her although variety is lacking. Totally dig these salad bar concepts, although I admit that I much prefer the one at F.I.S.H.